I am so grateful for all the love the podcast has received this week. Can you believe we made it to #4 in the Kids and Family Section on iTunes, and the overall New and Noteworthy section? On day 1, nonetheless! So thank you from the bottom of my heart! It was so exciting to officially launch on Tuesday, and I want to really thank my guests Emily, Jackie, and Alison for sharing their stories and their wisdom. It has been so much fun putting these episodes together and I hope you are enjoying them. I will be releasing a new episode every Tuesday, so make sure you subscribe on Itunes or Stitcher so you don’t miss an episode. The Rumbi Baby Stroller Bag/Behind the Seat Organizer. 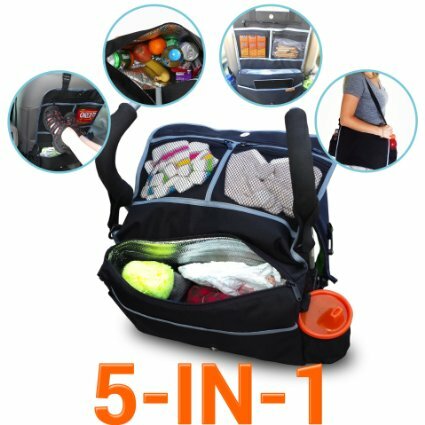 So, in full disclosure, I helped start this company with my brother and I had a big part in tweaking all the features of this awesome bag to make it the most functional and practical it could be. It may look like another black diaper bag, but it’s so much more than that. 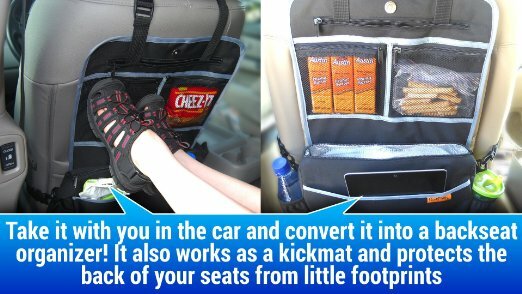 I primarily use mine hooked onto a seat in my car as an organizer. It’s so convenient and holds all the things that would normally be all over the floor. But then sometimes, I remove it and use it as a shoulder bag or sling it over the handlebars on my stroller, and it works perfectly for that. It’s insulated, so it’s a must-have for park or amusement park trips. Love it. Here’s the fun part… I’m doing a GIVEAWAY! If you simply leave a rating and review for the Extraordinary Moms Podcast over on Itunes, or share the podcast with someone or follow me on instagram and then leave a comment on this post saying what you did it, you’ll be entered to win a stroller bag. I will announce the winner on Monday in a post. Good Luck! 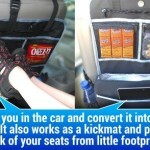 (You can also check out Rumbi’s other products like the carseat protector that covers your whole backseat and has a zipper panel in the middle to still allow you to access the middle console and seat belt. And for fans of the show, if you enter JESS1010 you can get 10% off any of the products on Amazon). Costco workout pants. Okay… I know there might be some people that care about the brand of their workout clothes, which is fine… I’m just not one of them. I care about comfort and style and that’s about it. These black ones are 32 Degrees Cool brand (are you sold yet?) and they are black with a subtle python pattern (their description, not mine). It’s subtle, not trashy, I promise. They are $14.99 and they are so comfy and do a lot to slim your legs and tush. Buy them. Alison’s Cookie Party. I know I mentioned this in the show notes of my episode with The Alison Show, but in case you missed it. 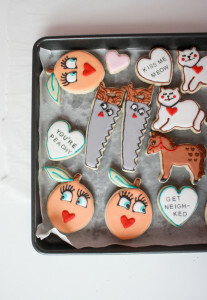 Alison created this amazing, extensive cookie decorating course to teach you how to make the perfect beautiful and delicious sugar cookies. Of course she’s artistic and creative and hers always look good, but I’ve been so impressed when other people who have taken the course post their own pics and they look AMAZING. This course works and is a perfect gift for a friend or for yourself. You’re welcome. Thanks again for all the support on the podcast. I can’t wait to keep bringing you interesting and inspiring episodes. Next week, I am talking with my friend Lindsey, who I know from our days of living in Ann Arbor, MI, but she now lives with her husband and three boys in Qatar. We’ll chat all about motherhood, international living, and travel. It’s a fascinating look into the life of a global mom. Remember to subscribe in Itunes so you can get the episode sent to you automatically. And don’t forget to enter the giveaway! Have a great day! 4 Responses to "Episode 5- Friday Favorites Vol. 5… and a giveaway"
I have listened to all five episodes at work this week! Love it! I also left a review on iTunes. So please enter me into drawing….Love ya! I left a review on iTunes. Not sure if it worked because I’m not very savvy that way, crossing my fingers it works!